Certain injuries bring patients into our Dallas and Plano, TX offices more often than others. When they do, there is often a reason behind the frequent occurrences. 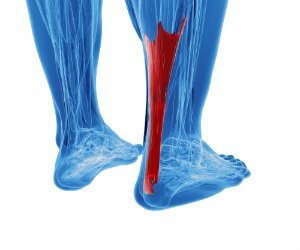 In the case of Achilles tendinitis, this can be explained by the constant role the Achilles tendon plays in allowing us to be mobile and participate in many physical activities. This common injury is often treated successfully with conservative care and can be prevented. Tendons are responsible for connecting muscles to bones. The Achilles is actually the strongest and largest of all the tendons in the body. It runs all the way down to the back of the heel from the bottom of the calf muscle and enables the foot to move up and down. When the calf muscle contracts, it pulls on the Achilles, thereby causing the foot to point downwards. When the muscle elongates, it pushes the tendon, which drives the foot upwards. This motion is clearly a major part of the biomechanical processes we all use whenever we walk, run, jump, pedal bikes, and even push down on the gas pedals in our cars. Now, it is quite unlikely you will ever develop a case of tendinitis from driving your car, but other physical activities can certainly increase your injury risk. The condition is sustained when the tendon has become inflamed and irritated, typically from repetitive motion. As we age, the strong tendon starts to weaken and becomes increasingly susceptible to injury. Accordingly, the problem is most often seen in middle-aged individuals who engage in intense physical activity on weekends, but otherwise lead fairly sedentary lives. In addition to those “weekend warriors,” tendinitis can be sustained by those who suddenly increase the duration or intensity of their training. The main symptom experienced with the condition is pain either in the back of the lower leg or just above the heel. This tends to be strongest following physical activity and is most severe after extended workout sessions. It will usually begin as a mild ache, but progresses in severity as time goes on. Other symptoms include tenderness and stiffness in the same area. Those are typically experienced in the morning. Age and gender. Middle-aged men tend to have the highest risk factor out of all demographics. Physical issues. Obesity, flat feet, and tight calf muscles increase the amount of strain the tendon faces. Training. Some of the risk factors are related to training practices. For example, someone is more at risk by running in worn-out shoes or on hilly terrains. Medical conditions. Individuals who have diabetes or high blood pressure also have an increased risk factor. The good news about this injury is that self-care measures can be rather successful. Once you are aware of the symptoms, begin your care for this Achilles injury at home with the use of the RICE method (rest, ice, compression, elevation). If you’ve tried self-care without seeing results, or the pain is severe or persistent, then it is time to give us a call and request an appointment for professional treatment with our doctors here at Dallas Podiatry Works. Even though the injury doesn’t usually require surgery, you would likely rather avoid pain and limitation in the first place. To reduce your risk of injury, make gradual progressions in the duration and intensity of your workouts. Stretch your calf muscles and Achilles tendons and use exercises to strengthen them. Consider cross-training as a way to avoid putting too much stress on the tendon from high-impact activities. Always wear shoes that feature solid arch support and provide ample cushioning. For additional information on Achilles tendinitis, or to request an appointment with either our Plano or Dallas, TX offices, give us a toll-free call at 972.566.7474. You can also schedule an appointment with Dallas Podiatry Works by using our online form.